Music is therapeutic for healing in treatment for addiction. Music generates critical thinking skills and is comforting to the mind, body, and spirit. People turn to music because of its positive psychological, emotional, spiritual, and mental effects. Music soothes the soul and helps in addiction treatment and recovery. Writing music promotes critical thinking in a healthy, clear mind. It infuses creativity and psychological healing. Sometimes listening to a particular song can remind a person of an emotion, event, or loved one. Writing music is a great outlet for a person recovering from addiction. An individual can express his or her experiences and feelings through writing music. Playing music is therapeutic for a person with the ability to play or has an interest in musical instruments. For a person who is musically talented, playing music can relieve symptoms of anxiety or depression. Playing music is a healthy way to stay connected to yourself and expresses feelings while adjusting to a sober lifestyle. Many people listen to music at home, in the car, or while exercising. Music has the ability to influence a person’s mood and emotions. Listening to music after a devastating event influences a person’s grief. Other times, listening to music uplifts the mood, reduces anxiety, and is therapeutic for a person in recovery. Creating lyrics for music lets a person write out his or her feelings and incorporate them into the form of a song. This is a great tool for a person who has difficulty talking about his or her trauma. An individual’s lyrics speak for him or her and act as a voice to share traumatic experiences. Substance abuse develops as a way to cope with stress, anxiety, arguments, or the death of a loved one. When overcome with grief, people might turn to drugs or alcohol to escape. 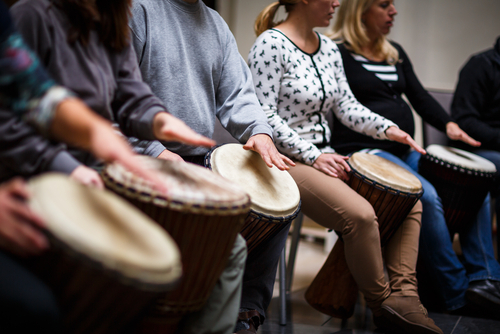 Music therapy teaches individuals to use music during challenging times and to prevent a relapse. Analyzing music, teaching music to peers, and singing requires critical thinking skills and helps for spiritual wellness.